So, it’s the day after Thanksgiving and you have a fridge full of leftovers: Don’t throw it out! Luckily, a lot of cooking magazines and lifestyle websites have taken action against pitching Thanksgiving’s tastiest dishes. They’ve come up with a multitude of clever and delicious recipes for your leftovers, so you can finish off your whole feast, pocket some spending money, and save from wasting perfectly good food this year. Here are some of our favorite ways to reuse your Thanksgiving meal leftovers. Shepherd’s Pie is a delicious, flavorful dish that will make use of your leftover turkey and potatoes. Check out Baked by Rachel’s recipe here. Do you still have a lot of turkey left? Shred it and use it in Bon Appetit’s Turkey and Mushroom Risotto recipe. The dish’s gravy is filled with the delicious flavors of mushrooms, onions, parmesan cheese, and parsley. It’s a warming winner for a cold weather dinner. It might even be worth cooking more sweet potatoes than needed if it means making this sweet single-serve dish after the big day is over. Country Living’s Sweet Potato Spoon Bread with Caramel-Pecan Topping is our favorite way to treat yourself after hosting the holiday at your 1st Lake home. You deserve to celebrate a successful Thanksgiving Day with the help of cinnamon, sugar, caramel, and pecans. Trust us. On a simpler note than most of the recipe’s we’ve listed so far, sometimes you just want a quick but exciting meal made from your decadent leftovers. Delish’s Turkey & Rice soup is your answer. Fall is a perennial favorite for so many reasons. The Saints season starts again (who dat! ), the weather cools down just a touch, and fall festivals help everyone get in the spirit. There’s also nothing quite like pulling on a cozy sweater and sipping on a warm drink brimming with the flavors of fall. But you don’t have to hit Starbucks for that famous Pumpkin Spice Latte. Save some cash by taking the DIY route — the results are just as delicious! This is a classic, of course. But instead of waiting in line at Starbucks, you can make your own at home with this recipe from the Food Network. Combine the milk, pumpkin puree, sugar, pumpkin pie spice and vanilla in a medium microwave-safe bowl, cover the bowl with plastic wrap and vent with a small hole. Microwave until the milk is hot, 1 to 2 minutes. Whisk vigorously until the milk mixture is foamy, about 30 seconds. Hot chocolate is a go-to drink for cold weather, but you can also add a taste of autumn during the fall months. Try this recipe for Spiced Hot Chocolate and enjoy while you watch the leaves change color. Sift all ingredients together into a large bowl. Whisk the mixture together to be sure the spices are evenly distributed. To serve, stir 3 tablespoons of the mix into 1½ cups (12 ounces) of hot milk. Serve in large mugs. Store the remaining mix in a tightly-sealed jar. Split the vanilla bean lengthwise and scrape out the seeds with the back of a knife. Combine the sugar, vanilla pod and seeds together and store in an airtight container for at least 1 week before using. This Whole Foods recipe is perfect for when you’re craving autumn flavors but the weather is still warm! Make These Recipes and More in Your New Home at 1st Lake! Get more great recipe ideas by checking out all of our Cooking Tips on our blog, and contact us today for more information about our residential communities! Brunch isn’t an everyday occasion, which might make it the best meal you can have. It usually signifies that you have some time to relax, or that it’s the weekend. If you have time off and want to spend it at home, you don’t have to miss out on brunch. There are plenty of easy recipes you can make in your pajamas, or with friends during the weekend. Read on for 4 easy stay-at-home brunch recipes! This recipe from Good Housekeeping is a great idea for weekend brunch. It looks very much like a pizza, except it has all of your favorite breakfast ingredients. On large sheet parchment, roll pastry to 12″ by 10″ rectangle. Fold 1/2 inch of edices to form rim; using a fork, seal rim and poke holes all over pastry. Place pastry on cookie sheet; bake 20 minutes or until golden brown. In small bowl, combine sour cream and Gruyére. Spread onto tart, creating 3 wells for eggs. Arrange bacon strips over topping. Crack eggs into wells; sprinkle with 1/4 teaspoon each salt and freshly ground black pepper. Bake until egg whites are set but yolks are still runny, about 12 minutes. Garnish with thyme. This Delish recipe is like a “portable garden,” and super simple as well. Now it’s time for a classic. Use this recipe from Dine & Dish to make your stay-at-home brunch complete. Place egg yolks in a medium bowl and slowly pour in butter mixture, stirring continuously. Whisk together until smooth and creamy. Stir in heavy whipping cream. For each serving, top 1/2 toasted English Muffin with a folded slice of deli ham, 1 poached egg and 3-4 Tablespoons of Hollandaise Sauce. Serve warm. It’s hard to call it brunch if there aren’t mimosas available. That’s why we’re including this classic mimosa recipe from Inspired Taste. If you are using, top mimosa with 1 tablespoon of Grand Marnier or triple sec. Let Us Help You Find the Perfect Apartment for Your Stay-At-Home Brunch! Memorial Day weekend marks the beginning of summertime for many of us. We honor the lives of those who have fought for our freedom and spend time with friends and loved ones. It’s a time of picnics, pool parties and cookouts, all of which have something in common: great food! To help you prepare, we’ve put together a list of simple recipes that will be easy winners for any Memorial Day gathering, whether you’re a host or just a participant. Read on for some delicious ideas that will help you spend less time in the kitchen and more time hanging out this Memorial Day weekend. Grilled chicken is sure to satisfy, and this recipe by Closet Cooking is an easy-to-make, delicious centerpiece for your Memorial Day gathering. There are few side-dishes that say summertime more than corn on the cob. Try this delicious recipe by Blissful Basil for a tasty twist on a classic recipe. It’s not a real cookout if there’s no mac n’ cheese! 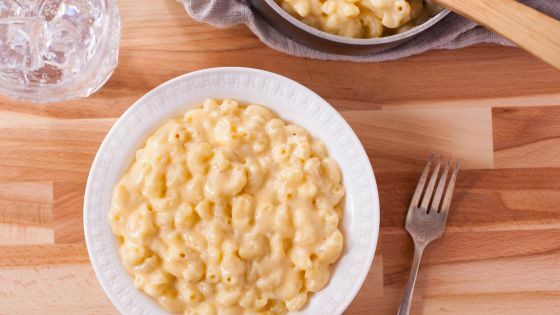 This recipe for easy macaroni & cheese by Genius Kitchen requires only 30 minutes and serves 6. In medium saucepan, melt butter over medium heat; stir in flour, and cook for 3-5 minutes stirring constantly to form a roux; add salt and pepper; slowly add milk, stirring well after each addition. This ingenious dessert by Family Fresh Meals takes just a few minutes to prepare. It’s also a relatively healthy option for a dessert dish. Wash fresh fruit and dry. 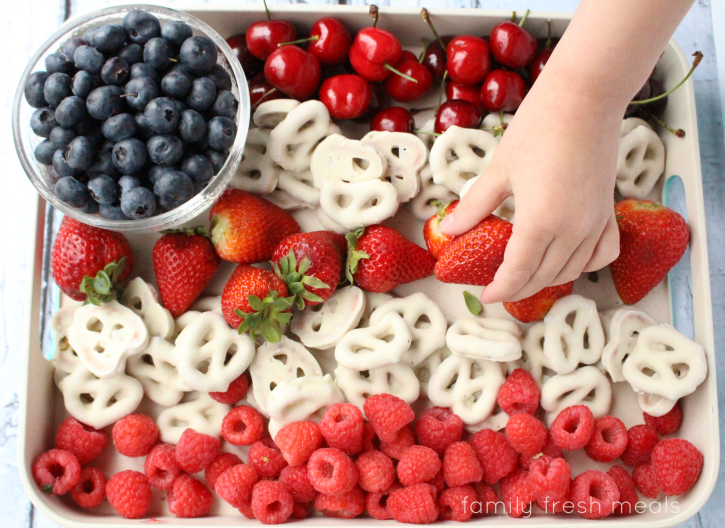 Lay out fruit and pretzels to represent the flag stripes. Place a small bowl of blueberries on the top left. We wish you a great Memorial Day weekend, and hope these recipes make your gathering delicious!